Swimming pools can be tons of fun by themselves, but no one can deny that a day in the pool is much more exciting when you have pool toys and games to keep you entertained. After all, there’s only so much time you can spend swimming back and forth and standing idly in the water before you get the urge to do something else. There’s also something remarkably awkward about a bunch of people standing next to each other in a pool while doing absolutely nothing. You’ve reached that inevitable realization, as every pool owner eventually does, but you’re not satisfied with just picking up a few random toys and floats at a local department store. No, there has to be more to it than simple beach balls and noodles. Surely there are other amazing pool toys out there that you’ve never even heard of or considered? Inflatable pool toys are usually the first that come to mind when you’re considering your options, so we’ve listed them first. You’ll be surprised at how creative and unique some of these toys are! Many have tried but few have matched the coolness of the original Giant Flamingo. At 80 inches long and about 48 inches wide, it has enough room to fit 2 people ages 8 and up. It’s got a good amount of positive reviews and for such a large floating flamingo the price point is actually very low. The Giant Turtle from Swimline has a 140 lb. weight capacity and can fit 2 or even 3 people thanks to it’s wide, round design and 74-inch diameter. It’s surprisingly durable – backed by a 30-day warranty, so you can put it to the test for a few weeks with the comfort of knowing that you’re covered if it’s not to your liking. With a length of 80 inches and a width of 45 inches, this one is almost as big is the Giant Flamingo but gives the impression that it is longer because there are more spots to grab onto. It’s made of 12-gauge vinyl and can support “multiple people” according to the manufacturer. Yet another floating animal gem from Swimline, the Giant Ducky Inflatable Ride-On comes in as the tallest float in this category, with a height of 48 inches. It’s a bit shorter than some of the others at only 60 inches in length, but the width and height give it presence in the pool and the riding style is unique and enjoyable. This one is ideal for anyone aged 5 and up. This interesting arcade shooter/water racing game includes two built-in water guns that are constantly supplied by the water of the pool. Two players stand side-by-side and strategically shoot at columns of balls. The first one to shoot all of the balls out of their column wins the round. It can be a fun betting game for adults or a challenging pastime for children. Reviews for this one are sparse to nonexistent, but having a relatively rare accessory like this in the pool isn’t necessarily a bad thing. This neat and unique air hockey set can be used both in the pool and on the ground. It includes the floating air hockey table with cushioned side rails, 2 puck pushers, and 1 puck. It’s surprisingly large so it’s suitable for both adults and children. There are plenty of ride-ons and rafts out there. But what if you want something you can climb inside and float around in, like a boat or car? Check out these three options for starters. This small but cool fireboat is designed to hold two children and is equipped with a built-in squirt gun that draws water from the pool. Constructed from heavy gauge PVC, it is one of the most durable products in this category. This is a great add-on to have handy for the kids when you’re teaching them how to swim or letting them have some fun in the sun. It has a heavy-duty grab handle, and the wide base does a good job of keeping it from capsizing. This is a super cheap accessory that doesn’t take up much space in the pool, so it makes senses to have it around so the little ones will have something fun to occupy themselves with. The SeaSaw Rocker is a larger inflatable that is more ideal for bigger kids and adults. Each side has sway handles attached so you can pull the momentum back and forth as you would with a real seesaw on land. The Cabana Islander is on the higher end of the price spectrum, but one look at it reveals why. It can support up to 6 adults and even contains cupholders. In fact, this one is made for both the pool and the ocean, so that gives you an idea of how sturdy it is. Impressively, it even includes a floating 16-quart cooler to keep your snacks and drinks safe. This large and impressive floating house is one of the coolest-looking pool habitats around, complete with two boats, a removable roof that converts into a raft, and buoy rings. It’s made of heavy duty vinyl and has a remarkable 500 lb. weight capacity, so it’s built to withstand rough pool play. This inflatable poolhouse is unique because it can be used in and out of the pool. It floats on the surface and you can swim under it and climb through the windows or just hang out inside. It’s basically a huge raft in the shape of a house, with an attached slide and pillars. You can get a 6-pc set of floating traffic signs that are fun little props for parties and get togethers. Aside from playing traffic-oriented swimming games, you can also use these to direct traffic around the pool. For example, you could set up the ‘Slow’ or ‘Stop’ signs in an area where the floor is slippery. The Water Wheel is an amusing and entertaining float that looks like a giant floating hamster wheel. Basically, for kids it functions the same way on the water, allowing them to crawl and turn the wheel the same way a hamster would. It has rainbow strings and sturdy construction, so it’s possible for bigger kids to get it turning pretty fast. This 24-foot volleyball net includes two plastic bases that weigh 80 pounds each when filled with water. The net is supported by lightweight but durable aluminum posts and the set comes complete with a hot pink colored volleyball. This is a miniature inflatable version for kids that includes a repair kit, which is useful just in case the 7 or 10 gauge vinyl gives out. It also comes with a shelf box, ensuring you’ll be able to fix it and keep it safely stored for many years to come. There’s also an inflatable volleyball and the goal posts have grommets for anchoring if desired. Alternatively, you could just let it float around in the pool freely. If you’re looking for a stable, large, and realistic basketball hoop to perch on the side of your pool, there’s really no need to look further than this. 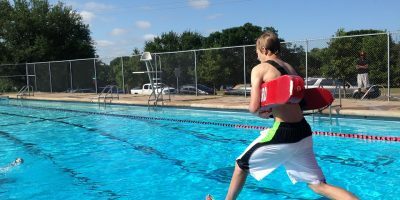 It stands at a fixed height of 36 inches, putting it high enough above the pool to make it challenging yet enjoyable for people of all sizes. It has a base that weighs 115 pounds when filled with water and a 14-inch steel rim with a real basketball net. It even includes a Dunnrite Pool Sport pool basketball. This isn’t some kiddy toy that “looks just like a basketball goal “– it actually is one. If you’d rather for go the floating basketball hoop variety, this is the one you should be considering. This is a much cheaper option than the poolside alternative, but it can still be lots of fun, especially for the kids. It uniquely features a sewn-in spring at the base of the hoop as well as a durable and plush fabric cover. The spring action and soft rim makes it great for action-packed dunking. It also folds flat for convenient and easy storage. This one is a bit harder and has more negative reviews, but it’s still worth mentioning as a hoop that floats on a circular PVC frame and includes a red, white, and blue heavy duty net. A small basketball is included. This 9-inch pool football is covered in water-resistant Tricot fabric and constructed of lightweight foam surrounding an inflatable pouch. It’s recommended for ages 6 and up but it’s a great toy for anyone who likes playing football. Using a real football in the pool isn’t as fun because the ball gets slippery, heavy, and hits harder when it’s wet. Pool footballs like the Active Extreme Cyclone are designed to maintain good aerodynamics while staying soft even when soaked. It’s also available in multiple color schemes – Purple and Yellow, Blue and Green, and Red and Yellow. This bat and ball set is waterproof, lightweight, and durable, constructed from high quality Neoprene. It’s also available in four different colors – red, blue, green, and orange. The grip is designed to provide optimal traction when wet. Of course, to complete the baseball experience you’ve got to have gloves, so getting this set next makes sense. It’s surprisingly affordable and the gloves come with a velcro pocket that makes it easy for anyone to catch. The ball is of course waterproof and the color of the gloves will vary between red, blue, green, and orange. This fun tennis-like game includes two paddles and two waterproof “splasher” balls. The 11-inch rackets are covered in waterproof stretch fabric and provide just the right amount of bounce. If you’re looking for a quick and easy way to play mini golf from the side of your pool, the Blue Wave Aqua golf game is definitely worth consideration. It comes with a floating green and 12 practice balls in 2 different colors so each player can pick a color. It also includes 2 cups and 2 flags along with a chipping mat and rubber tee. No golf club is included, but that shouldn’t be a problem for most golf enthusiasts who already own one. Comes with 4 poles and 18 floating fish for in-the-pool fishing fun. Ideal for children ages 3 and up but it can be fun for anyone with a good imagination and a little competition. This is really a water gun that looks and functions like a crossbow, which makes it so much more fun than a typical squirt gun. Combine something like this with a few floating targets and you can have a blast testing your aquatic accuracy. Instead of launching streams of water at targets, why not launch some water balloons at friends? The Aqua Bow is like a slingshot for water balloons. It even includes 50 free water balloons and they’re cheap enough to where you could easily buy several Aqua Bows and wind up with a few hundred water balloons for an epic pool battle. If you’re going to get beach balls you might as well get more than one. That keeps you from having to fight over them during a pool party. The Kidsco beach balls are known for being easy to blow up and they stay inflated for along time. If you’re looking for something a little bigger, why not go for the 6-foot Giant from GoFloats? It has a rapid valve for fast inflation, but you will need to use a pump which is not included. This one is highly durable and ideal for large parties. Glow-in-the-dark beach balls are loads of fun at night and this particular set includes two glow sticks. They’re 24 inches in diameter, making them a nice medium-sized ball that”s perfect for knocking around the pool. This is one of those odd products that isn’t super popular but it’s still very interesting nonetheless. Unfortunately, it’s rareness means that there aren’t any reviews for it at this time. Of course, snorkeling and diving is most enjoyed with a nice diving mask and snorkel, so a set like this should be first on your list in this category. It’s intended for teenagers and adults ages 12 and up. The soft fit facilitates ideal suction and keeps the mask firmly yet comfortably secured. If you’ve never played with a Toypedo, you’re really missing out. Their special hydrodynamic design allows them to glide up to 20 feet underwater. If you’re going to be spending some time below the surface, you might as well have a few toypedos handy. These brightly colored, easy-to-grip play sticks are perfect for diving exercises and games. Throw them to the bottom of the deep end and compete with others to see who can collect the most, or throw one in and see who can get to it first. There’s really nothing to say about these. They’re colorful rings that you can throw in the pool and retrieve, just like the play sticks. Playing cards in the pool can be a lot of fun, but using conventional cards will almost always result in a ruined deck. This nifty floating game station and pack of waterproof cards gives you the platform and deck you need to have hours of card-playing enjoyment in the pool. It even comes with two floating chairs, which can be connect to the table with bungee ball ties. Some reviewers have noted that it is very important to tie the chairs to the table to prevent yourself from floating away from the table. This floating chess/checkers/backgammon set uses magnets to keep the pieces from sliding off the board into the water. The two-side board has the chess/checkers squares on one side and the backgammon board on the other. This floating pool pong table is 54 inches long and 27 inches wide, with a hard surface that ensures good bounce action. It also comes with 2 oversized floating paddles, a net, and three regulation sized ping pong balls. This floating beer pong table is easily one of the coolest items on this list. It can hold 28 cups – 10 cups on each end and 4 cups along each side – and it comes with 5 pong balls and a built-in cooler that sits in the middle of the float. This durable inflatable water slide is made of 20 gauge heavy duty vinyl and includes a built-in spray nozzle that can attach to your water hose to keep the slide surface wet and slippery at all times. The climbing footholes and 8 grab handles make it easy to re-position and maneuver. 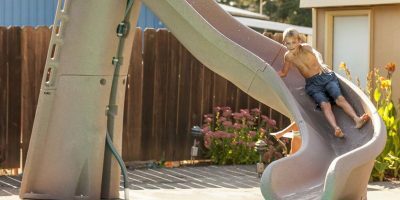 Although a real pool slide like this one is a bit higher on the price spectrum, it may be well-worth the expense when you consider how much fun it can add to your pool environment. It has an 11-foot runway and it’s 6-feet 5-inches tall with enclosed stairs and large handrails. This is an interesting new sport that uses a special hydrodynamic ball that looks a lot like, you guessed it, a watermelon. The ball travels well underwater and is easy to grip. The object of the game is for opposing teams to try and bring the ball all the way to their opponent’s end of the pool and lay it on their deck. This large 2-person lounge raft features opposing headrests and cupholders on each side. Measuring more than 6 feet long and 5 feet wide, it easily can fit two large adults with room left over. It includes an emergency repair kit as well. This thing is huge and is actually intended for use in rivers, lakes, and other large bodies of water. Still it’s only about 10 feet wide and 13 feet long, so it can fit into most residential swimming pools — although it would be best in a longer pool. The raft includes 2 cooler bags, 6 cup holders, and a convenient platform that makes easy to swim onto. It seats 7 people comfortably so it’s a really cool floating station to have around at parties. This a great deal considering how much comfort and convenience it provides. It’s made of durable 18 gauge vinyl and is inflated via two separate air chambers. There are two cupholders – one on each side – and 2 grab handles that make it easier to climb into while you’re in the pool. The Canopy Island Lounge is a lot like a round, floating air mattress. 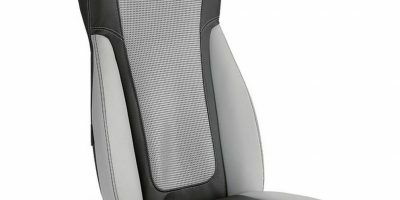 It has a built-in backrest, detachable sun shade, two cupholders, and two separate air chambers for added safety and durability. Why not float around on a slice of pizza while eating a slice of pizza? Doesn’t that sound exciting? What’s really cool about this 6-foot 5-inch float from Swimline is that it includes bungee connectors that can be used to connect the raft to other pizza rafts! So technically, you could connect 8 of them for a full pizza raft. This massive pineapple raft can support up to 250 lbs and is 73 inches long. Drinking a pina colada and snacking on pineapple slices in the sun while relaxing on a floating pineapple – could the situation be any more luxurious? Who needs a regular float when you can float around on a giant donut instead? There are plenty of jumbo donut floats out there, but the Play Platoon donut float comes with the cool feature of having a bite taken out, which serves as a convenient footrest. This is a surprisingly strong water gun for the price, shooting up to 5 streams of water simultaneously. It has a cool flip-up sight, pump-action handle, a 22-ounce tank capacity, and a stream range of up to 34 feet. Try saying the name of this water gun three times fast! Tongue-twisting name aside, at about 2-feet long this thing makes other water guns look like child’s play. This is the water gun you select when you want to be the king of the hill or the bully of the party – unless someone has the dreaded hydro cannon mentioned below. This thing shoots really hard and large blasts of water after you’ve pumped it a good number of times. It has a maximum range of 35 feet, so you can shoot all the way cross most pools. You also get the added perk of an attached blast shield which blocks incoming water. If you thought a squirt toy would be much weaker than an actual water gun, you were wrong, according to the stream machine. It has a handle that makes it look like a shotgun and reloading it is as easy as drawing water from the pool. It’s amazing how much squirt power you get out of this thing considering how cheap it is. It looks like a light saber but it’s actually a high-powered squirt stick with a 24-inch barrel that can be quickly reloaded with water in one draw. This is a cool spin on the conventional squirt stick because it looks like an alligator. One thing that makes this toy particularly appealing is that it is covered in soft padding and can shoot a stream of water up to 30 feet. The huge 88-inch Little Tikes Beach Ball Sprinkler shoots water from all sides, making it a fun addition to any pool area. This is a very popular item, having been awarded the Parent’s Choice Award. Why use a regular sprinkler when the kids will obviously love this one much more? It shoots streams of water out of 12 separate Splash Patrol characters and can be attached to any standard garden hose. This is perhaps the coolest selection in this category, as an amphibious remote control car that can seamlessly travel from land onto water and vice versa. It has an impressive control range of up to 200 feet on land and 150 feet on water. This well-designed yet affordable electric race boat can reach speeds of about 6 miles per hour and has a remote control range of about 20-30 meters. This small but durable 4×4 amphibious remote control car is one of the most popular out right now. It’s a good alternative for the kids when you don’t want the little ones steering a large or heavy RC vehicle around your deck. With water activated sensors these cool little fish start swimming on their own as soon as they’re submerged in water. This one doesn’t have sensors that cause it to swim automatically. Instead you have to push a button to make it start. Hypothetically, if you were to own all of the items on this list, you’d be able to play just about any pool game, sport, or activity you could think of. Fortunately, you don’t need to have it all to have a blast. Start with a few categories that peak your interest the most and then build from there. 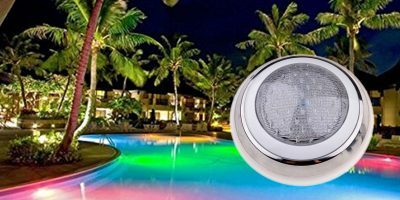 Above we listed more than 60 of the coolest toys, floats, and accessories that will make your pool a more enjoyable and entertaining place to be, so you should have all the inspiration you need to start your journey.